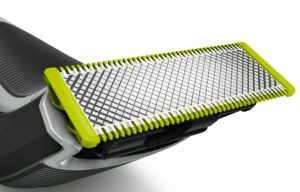 Philips is one of the reputed names in the men’s grooming industry and is known to come up with models that have the best of design, technology, quality, performance, and durability. These are some of the main factors as to why Philips is one of the most respected brands today. The OneBlade Pro QP6510/30 Hybrid Trimmer & Shaver (12-length comb), is an excellent example of these factors. This trimmer has a sleek design and is packed with some powerful technology that helps you achieve the perfect style/length/grooming of your hair. Read our hybrid trimmer and shaver review to know about the features, and pros and cons of this product to understand if this product justifies its cost. Adjustable precision comb that comes with 12 inbuilt lock settings for perfect trimming of beard, moustache, or goatee. 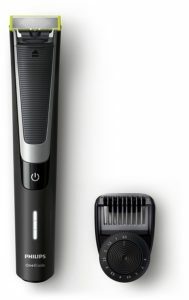 The Philips OneBlade Pro QP6510/30 Hybrid Trimmer & Shaver is one of the best electric trimmers on the market, and very highly rated. It has 4.3 out of 5 stars with 81% over four stars, and just over 10% one star. It sells for £45 currently, and the replacement cartridges at £12 for a single or £20 for a 3 pack. It is a really innovative trimmer for shaving.